No matter how big or small you are, whether you have budget or not – you need to be monitoring changes in Active Directory. There are awesome Active Directory audit solutions out there. And ideally you are using one of them. But if for whatever reason you can’t, you still have AD and it still needs to be monitored. This solution helps you do just that. Too many times we see dashboards that showcase the biggest and highest frequency actors and subjects but get real – most of the time what you are looking for is the needle – not the haystack. So we show the smallest, least frequent actors and objects too. That’s what we’re talking about! Hey, executives may say that’s just the weeds but we know that with security the devil is in the details. Now, you knowledgeable Splunkers out there are probably wondering if we get these events by defining them at index time. And the answer is “no”. Randy provided the Windows Security Log brains but we got a real Splunker to build the app and you’ll be happy to know that Imre defined these new fields as search time fields. So this works on old events already indexed and more importantly doesn’t impact indexing. We tried to do this right. Plus, we made sure this app works whether you consume events directly from the Security log each computer or via Windows Event Collection (which is what we recommend with the help of Supercharger). For those of you new to Splunk, we’ll quickly show you how to install Splunk Free and our Splunk App. Then we’ll show you how in 5 minutes or our free edition of Supercharger for Windows Event Collection can have your domain controllers efficiently forwarding just the relative trickle of relevant change events to Splunk. Then we’ll start rendering some beautiful dashboards and drilling down into those events. 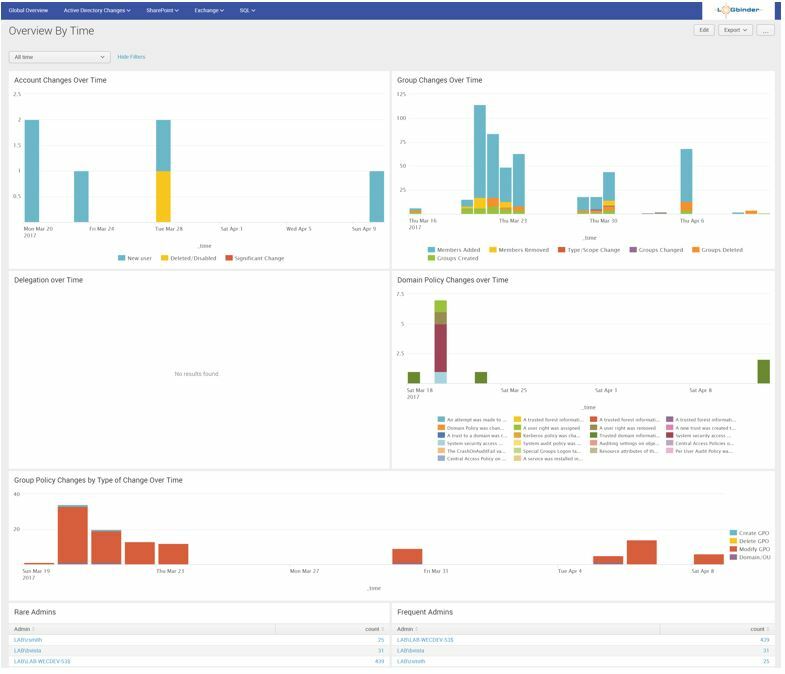 We will briefly show you how this same Splunk app can also analyze SharePoint, SQL Server and Exchange security activity produced by our LOGbinder product and mix all of that activity with AD changes and plot it on a single pane of glass. Or checkout the solution page at https://www.logbinder.com/Solutions/ActiveDirectory where there are links to the step-by-step directions. And if you are already proficient with Splunk and collecting domain controller logs you can get the Splunk app at https://www.logbinder.com/Resources/ and look under SIEM Integration. In June 2016 Microsoft released SQL Server 2016 but due to a bug in their Exchange 2016 release, we wanted to make sure that we performed very extensive testing of this latest version of SQL Server and its new auditing features to make sure we didn’t discover any bugs there too. We also performed very stringent testing of LOGbinder for SQL Server to make sure that our software continues to meet and exceed our internal standards. With the release of SQL Server 2016 came not only many new features but also some new audit events. These include audit events related to committing and rollback of transactions, handling master keys, column encryption keys, database scoped credentials, as well as events related to external data sources (think, for example, Hadoop), external file formats and external resource pools. New installer – Our new installer automates some of the prerequisites required during the installation process. Installation time is now just a couple of minutes. Improved service resilience – We have improved on the delay that was reported by some customer when restarting/starting/stopping the service. Purge processed files - We have added a new option to purge SQL audit files that are no longer being used by SQL Server and have already been processed by LOGbinder. Enhanced application activity events - Information events written to the Windows Application log now include statistics including entries exported, elapsed processing time and events per second (EPS). These are just a few of the improvements in this release of LOGbinder for SQL Server. For full details, check the release notes below. Customers with current support and maintenance contracts can access the latest version at the link below. To upgrade to the latest version just run the installer on top of the previous version. No data or settings will be lost. Please note you will need to request a new license key for this version. You can do so by clicking on File in the LOGbinder Control Panel, then License and send the license information to licensing@logbinder.com. ​Thank you for your hard work in protecting sensitive information, and thank you for your support! One of our team members was recently reminiscing about a past IT career and how at their organization SharePoint was a document storage facility hosting timesheets, resumes and the weeks’ cafeteria menu. Years later, SharePoint has become a widely-used workflow platform for critical business processes and a clearing house for sensitive unstructured data. Over the years, as we have had more interactions with our customers and audience, we have become convinced that SharePoint security auditing is a requirement for the millions of SharePoint customers around the world. It seems that on a monthly and weekly basis we are hearing reports of more information leaks and data thefts. You need the ability to open up closed applications like SharePoint and Exchange and see who’s doing what. In May 2016 Microsoft released SharePoint 2016 but due to a bug in their Exchange 2016 release, we wanted to make sure that we performed very extensive testing of SharePoint auditing to make sure we didn’t discover any bugs there too. We also performed very stringent testing of LOGbinder for SharePoint to make sure that our software continues to meet and exceed our internal standards. What is new in LOGbinder for SharePoint 2016? Improved service resilience – A few customers have reported to us that from time to time the LOGbinder service is stopped. The detailed service logs showed that delays between SharePoint and the farms’ SQL Server were causing timeouts. These timeouts were being reported by SharePoint and were long enough to negatively impact the LOGbinder service. Now the LOGbinder service will handle these interruptions with less impact. 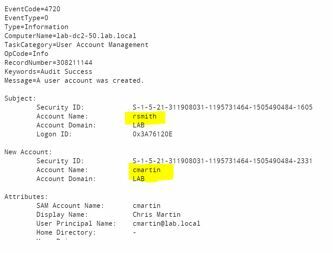 Weird username prefixes removal – Some customers were wondering why they are seeing weird characters prefixing usernames in the logs. You can find more info about it here. We have included an option to remove the claim type characters from the data. Site collection selection – Managing a handful of site collections is easy. Some customers though have thousands and thousands of site collections being monitor. Now you can use CTRL-A to select all site collections in the LOGbinder input. These are just a few of the improvements in this release of LOGbinder for SharePoint. So far, 2014 has been a great year for application security intelligence. All the major SIEM providers offered new or additional integrations for LOGbinder. 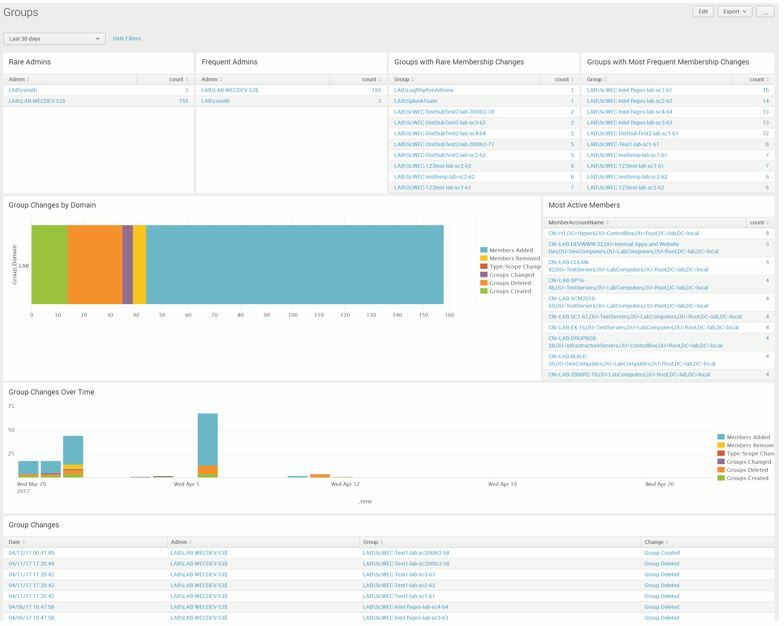 Hundreds more organizations deployed LOGbinder for their SIEM and many of them received significant features and updates from prior versions. We're thrilled with the results and hope you are too! We are very excited to let you know that IBM Security's QRadar product team produced DSM integrations with all 3 LOGbinder products. This brings Exchange, SharePoint and SQL Server security audit logs to the QRadar-based SOC. In addition to the Device Support Module (DSM) support, LOGbinder has also received LEEF certification. The implications are huge. Now QRadar customers can consume critical security audit logs from their enterprise applications with minimal setup and configuration. LOGbinder collects, translates and delivers the audit information via LEEF-certified output. QRadar consumes that information and allows analysts to easily prioritize and present critical security correlations where, when and to whom it matters most. Curious about what SIEM solutions have solid Exchange, SharePoint and SQL Server security audit capability? More news is coming next month, but the full list is AccelOps, AlertLogic, AlienVault, Blue Lance, EventTracker, GFI EventsManager, IBM Security QRadar, HP ArcSight, LogPoint, LogRhythm, McAfee ESM (formerly Nitro), RSA Security Analytics (formerly enVision), Solarwinds LEM and Splunk. Exchange audit is increasingly critical to security analysts. This means the demands on LOGbinder EX have increased too. Our development team has responded with new features, now in our labs for testing, to help security analysts dial-in on the new pain-points and remove them. Now, directly from the LOGbinder interface, security analysts can configure mailbox audit policy and autofill the PowerShell and Exchange server URL fields. These changes offer more than merely convenience. These new features allow far better mailbox “on-boarding” (and whatever the opposite of that is). And it makes it easier for security analysts to do their job; no more slow dances or hat-in-hand sessions with the Exchange admin(s). SQL Trace to SQL Audit. Discussion and links to more details in a white paper. Understanding and Changing Exchange audit poll interval. Exchange takes its own sweet time to return audit results, but you can speed it up. SQL Server audit support -- which version makes it available? Lots of organizations need to first determine if the superior SQL Server audit function is available. LOGbinder newsletters. Tech tips, product updates, SIEM news, notes from the field. Thank you for your support. We'll catch up next year.